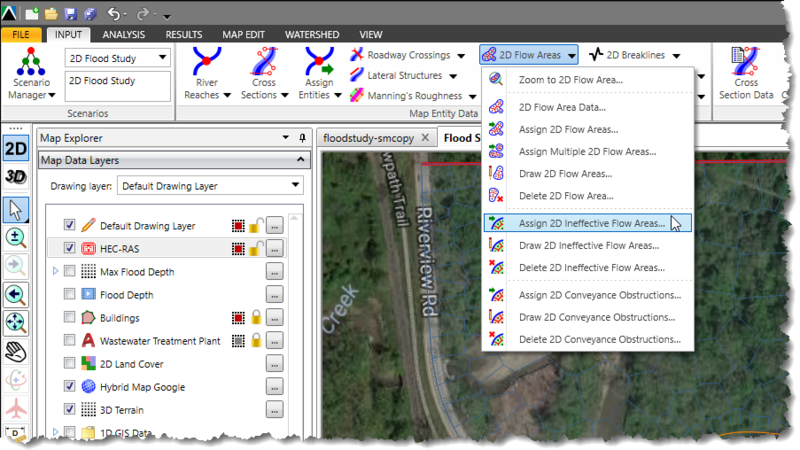 Ineffective flow areas can be assigned to the 2D mesh to account for regions where the water is not actively being conveyed. 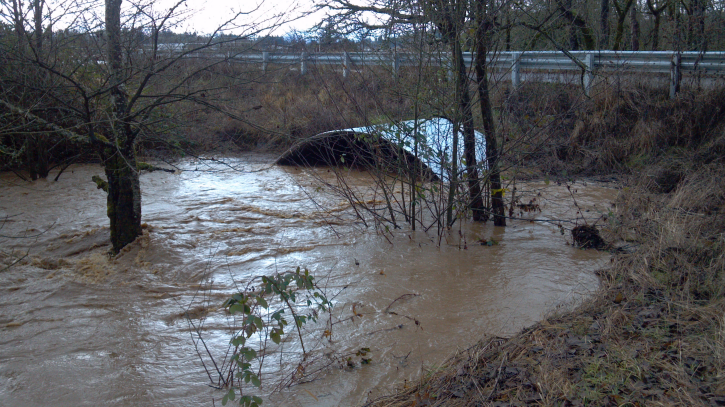 The water will pond in such areas, and its velocity in the downstream direction will be close to zero. This water is included in the storage calculations, but it is not included as part of the active flow area. When using ineffective flow areas, no wetted perimeter friction is included at the boundary between the ineffective flow area and active flow area. 2D ineffective flow areas are assigned using polygons. 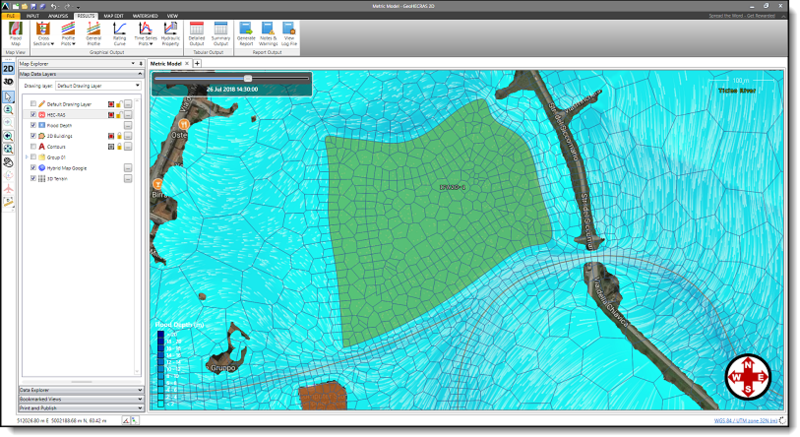 The software will automatically refine the 2D mesh to accommodate the ineffective flow area shape. From the Input ribbon menu, click the 2D Flow Areas menu item, and then select the Assign 2D Ineffective Flow Areas command. The Assign 2D Ineffective Flow Areas dialog box will be displayed. The Assign 2D Ineffective Flow Areas dialog box will temporarily disappear and a prompt will be displayed on the status line informing what to do next. The Assign 2D Ineffective Flow Areas dialog box will redisplay. Click the [Apply] button. The selected polygons will be assigned as 2D ineffective flow areas. 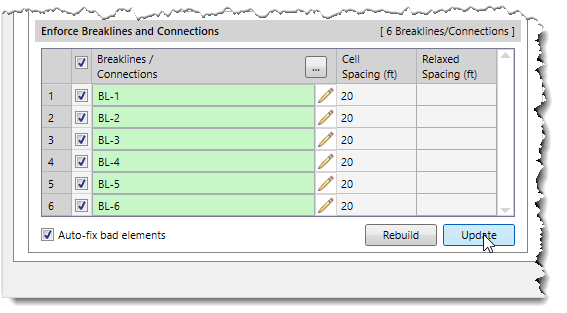 Choose the Select Polygon Shapefile radio button option. Click the [Apply] button. The polygons on the shapefile layer will be assigned as 2D ineffective flow areas. From the Input ribbon menu, click the 2D Flow Areas menu item, and then select the Draw 2D Ineffective Flow Areas command. 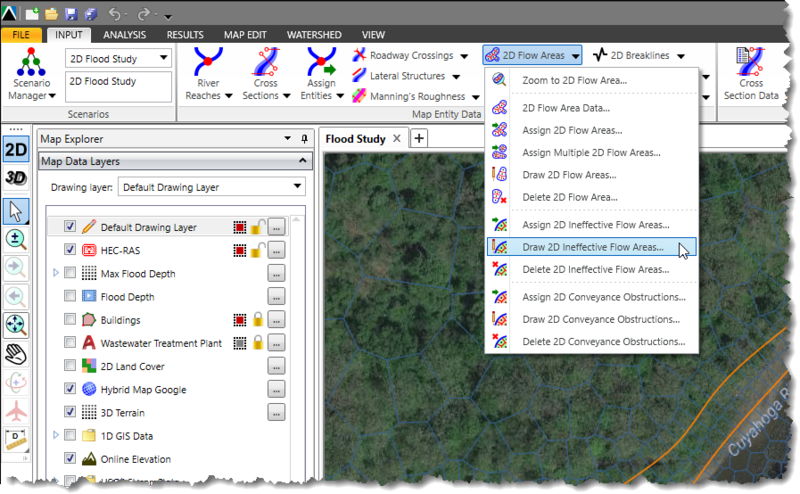 The Draw 2D Ineffective Flow Areas dialog box will be displayed. Click the [Draw] button. The Draw 2D Ineffective Flow Areas dialog box will temporarily disappear and a prompt will be displayed on the status line informing what to do next. After the polygon has been drawn, the Draw 2D Ineffective Flow Areas dialog box will redisplay. Repeat the process for all other polygon areas to be defined as 2D ineffective flow areas. Click the [Update] button and the software will incorporate the 2D ineffective flow areas into the 2D mesh.